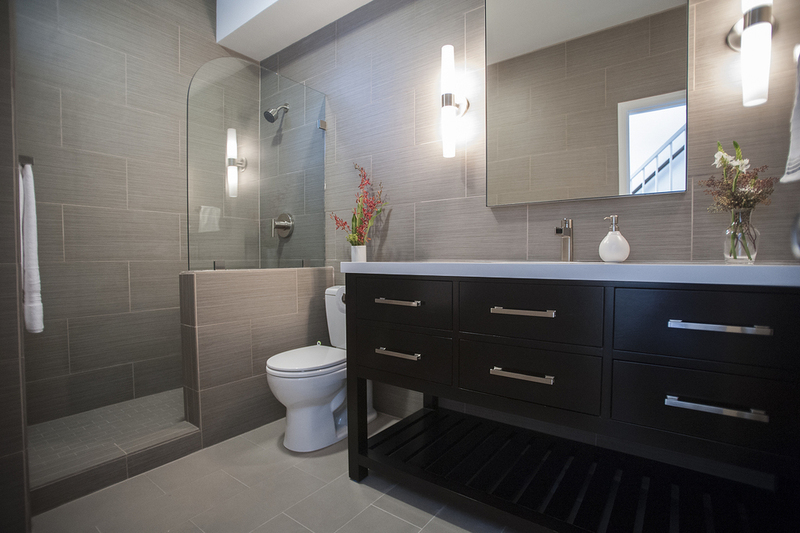 It doesn't get much more modern than this sleek master bathroom. 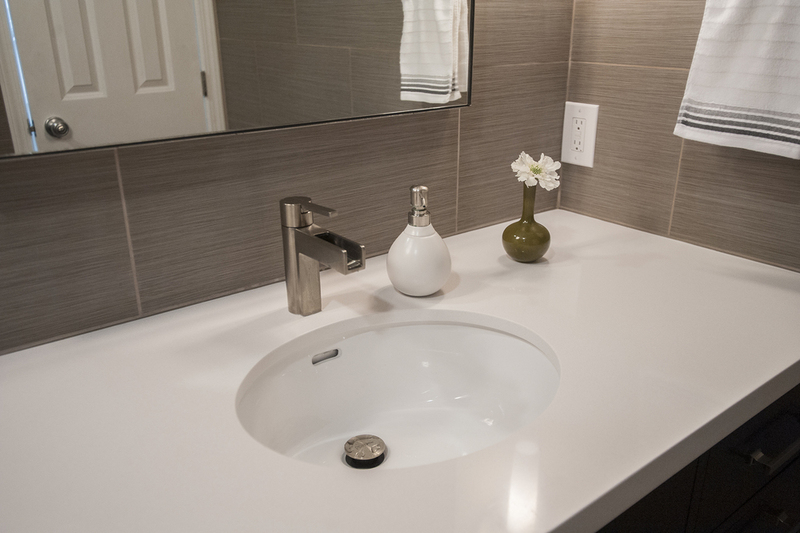 A custom floating vanity paired with a Silestone frame welcomes you into this clean and bright space. A floor to ceiling window with privacy film gives the feeling of a much larger space. Wall mounted faucets, recessed medicine cabinets with integral lighting and a wall mounted toilet finish off the modern aesthetic. With the good bones of an Eichler, nearly anything is possible. With limited space to work with, this bathroom was in dire need of a new layout. Removing the tub, re-locating the sink and creating a larger shower opened this small space just enough to be able to enjoy. Subway tile with a glazed finish and hand picked counters add warmth to the space while keeping true to the period of the home. 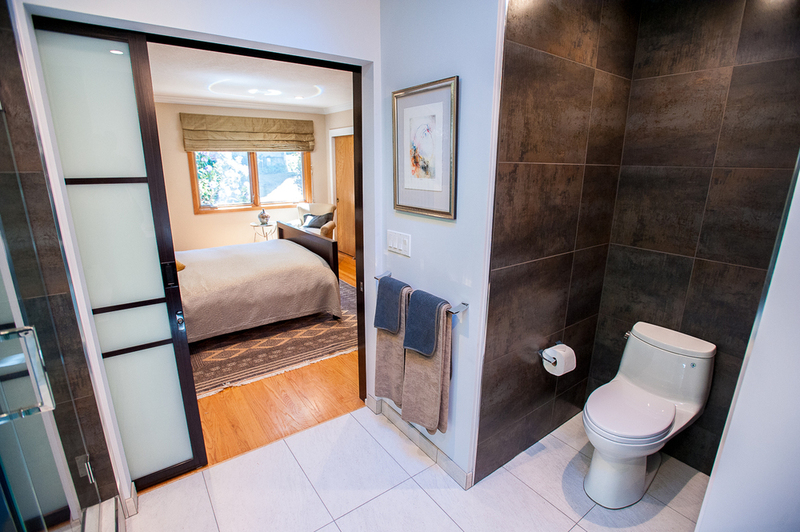 With only one bathroom in the house our clients were in desperate need for an ensuite off of their master bedroom. We took a small corner of their once square bedroom and stole a little square footage off of their attached porch and gave them the bathroom they had longed for. 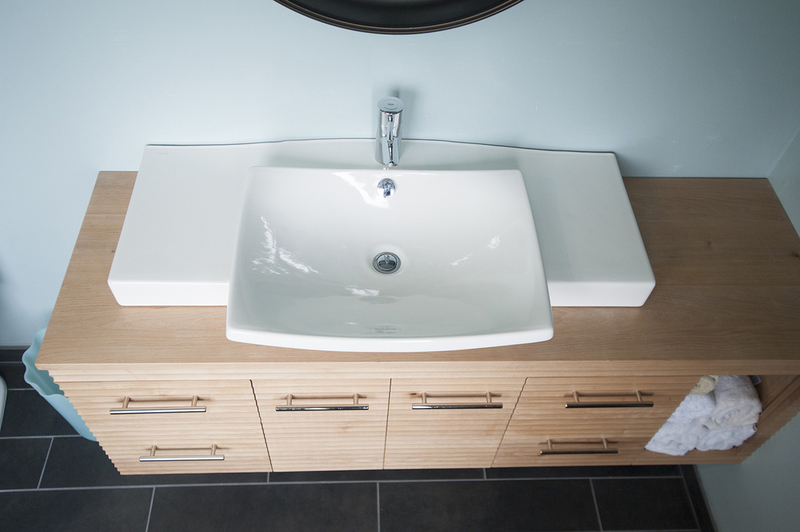 A floating vanity with a vessel sink and wall mounted faucet save space and allow for more countertop storage. 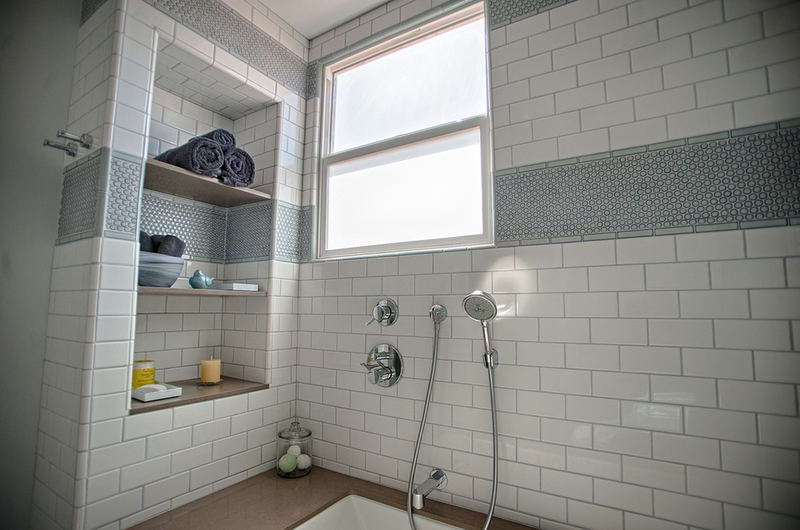 Natural stone tiles on the shower walls and an awning window overlooking the Bay make this small bathroom feel bright and open. 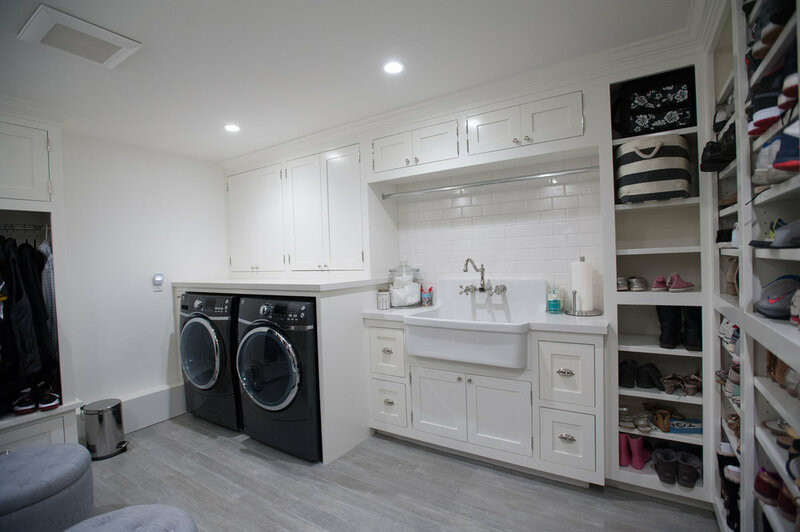 Once a cramped laundry room tucked in the corner of a garage is now a very large laundry room / drop zone that accommodates a large family. 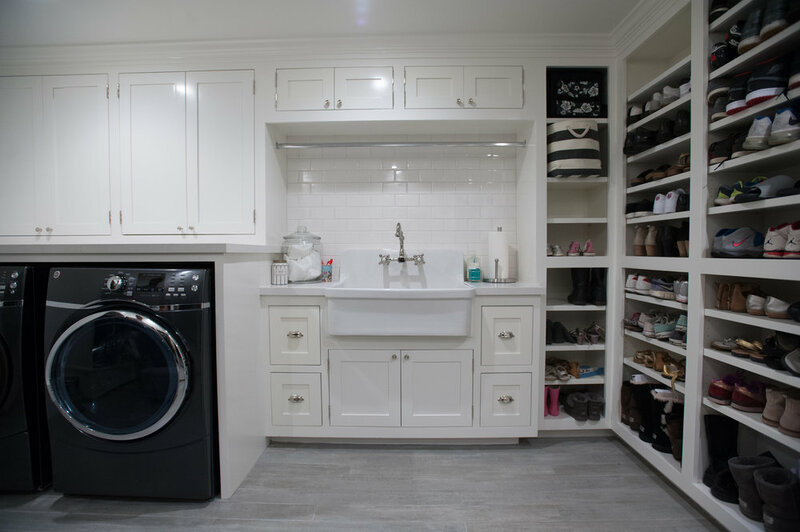 Incorporating built-in "lockers" and plenty of shoe shelves, this laundry room functions much better and will allow for growing room! Custom cabinetry, heated floors and an oversized laundry basin finish off the space. 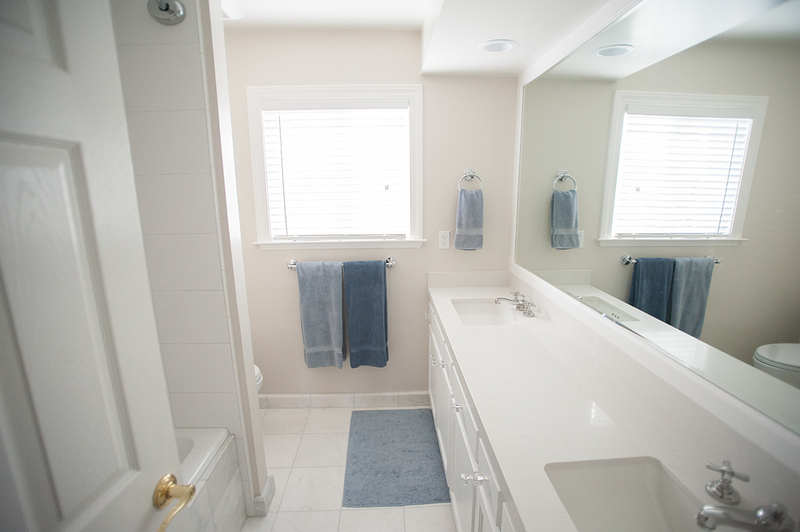 With limited space and updated materials, a once cramped master bathroom was transformed into a luxurious ensuite. 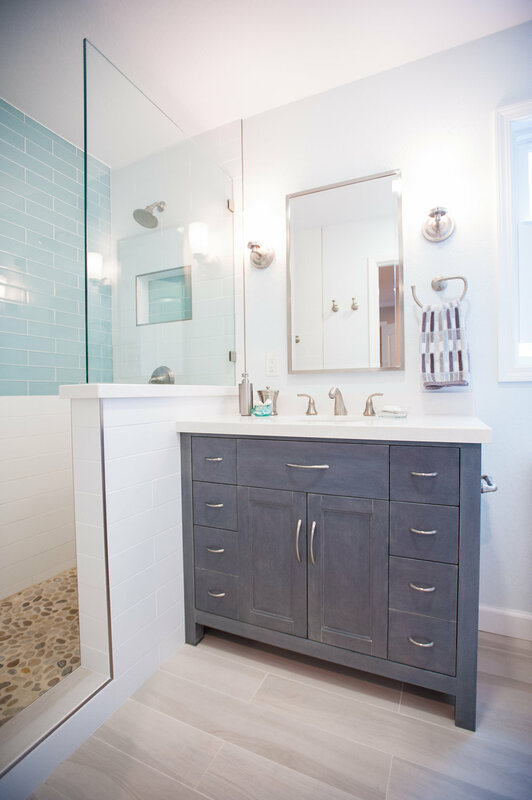 Updated finishes including brushed nickel fixtures, a custom vanity and beautiful sea-foam glass tile this master was completely overhauled. 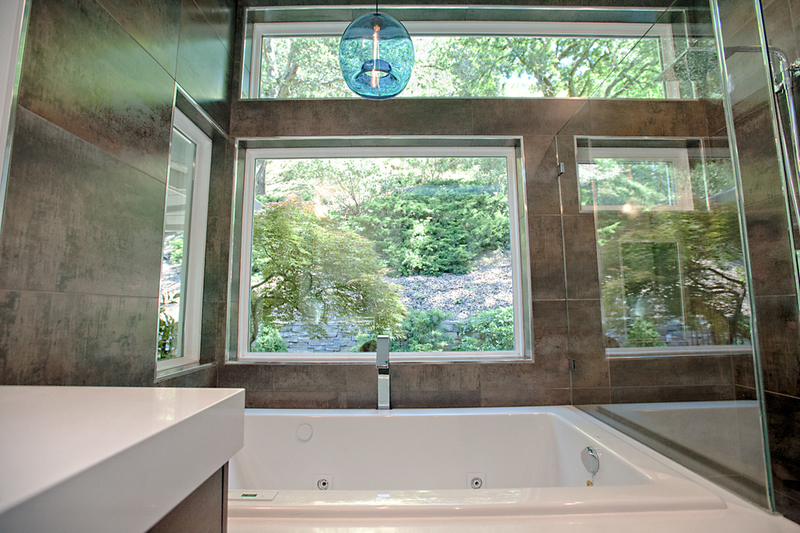 The bathroom was designed by Jill Cordner and with her help the clients couldn't be happier with the finished product. High-end modern finishes were used throughout this renovation, not a single detail went unnoticed. 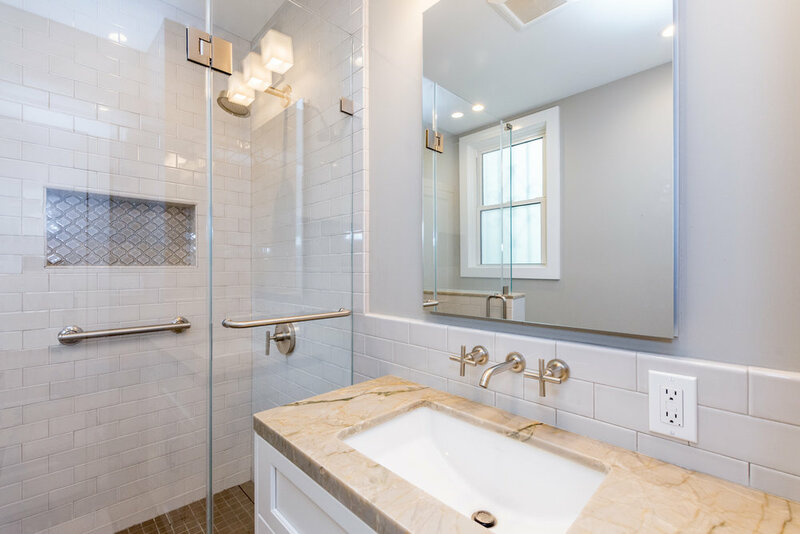 The tile design in this bathroom is so meticulous, the shower pan as well as the tiled toilet alcove were thought out as the installation began and the end result was worth every minute. 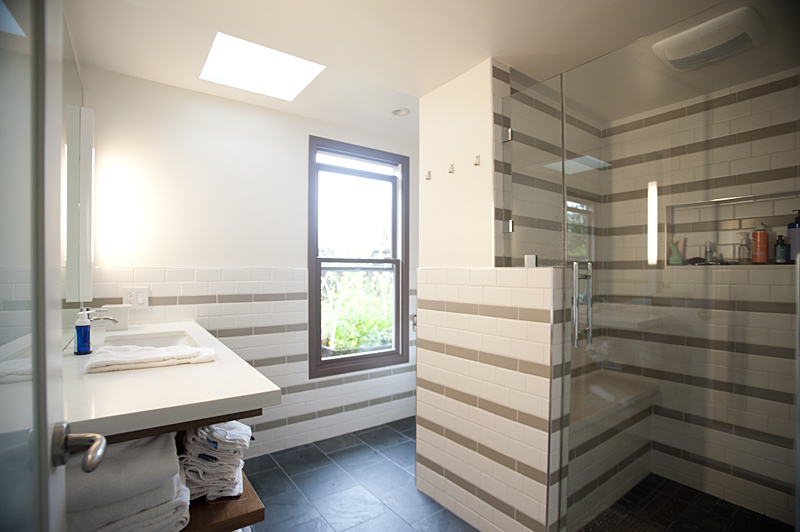 With all of the natural light coming through the linear skylight and the large single paned windows, this bathroom feels spacious and inviting. This dual purpose space now functions perfectly as both a guest bathroom and as a laundry room. 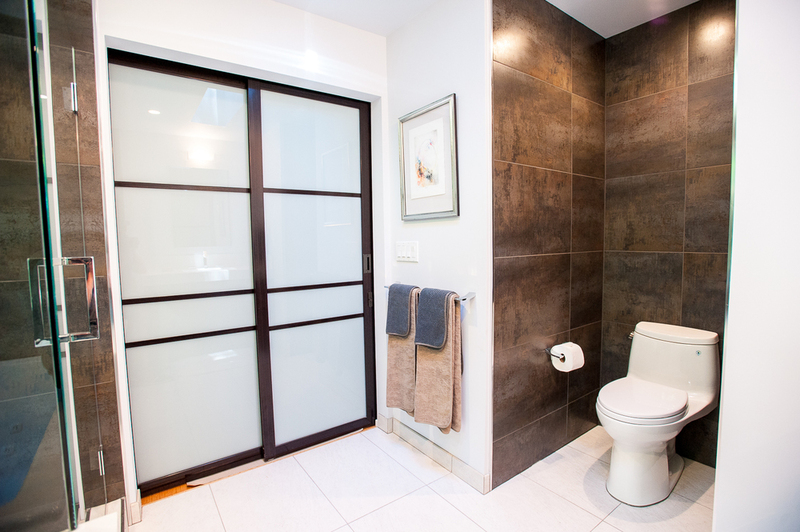 Custom sliding doors conceal the laundry fixtures while not in use. The oversized laundry sink fits into the cabinet design seamlessly as well as the hidden pull out hamper next to the sink. 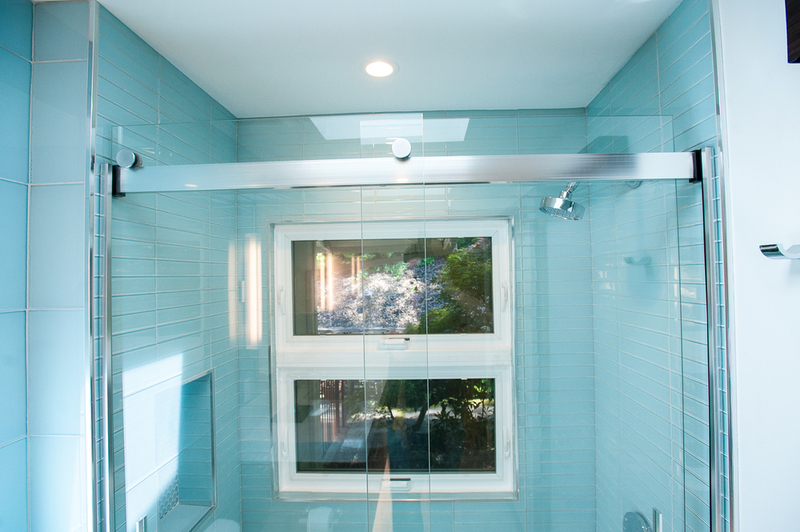 Full glass tile walls and chrome fixtures complete the modern look. 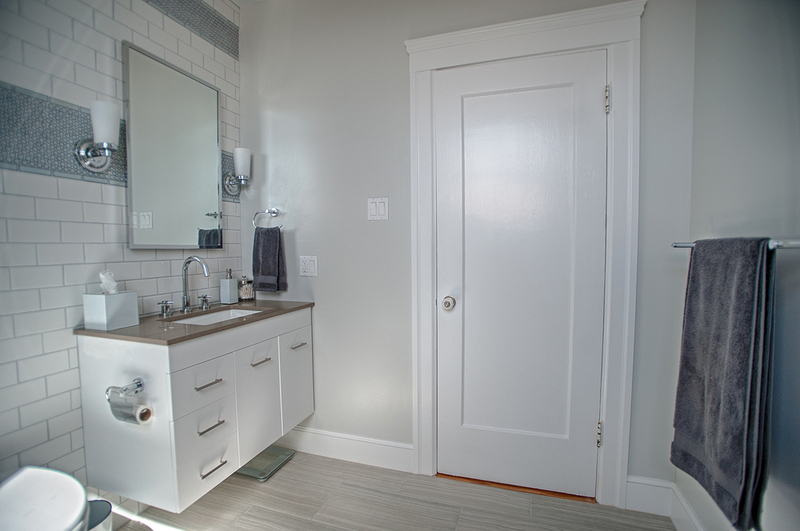 This San Francisco bathroom was updated with special attention paid to keeping the classic feel to the room. The existing footprint was used as we added updated cabinetry and hardware all within the classic theme the homeowner was looking to preserve. We added more light to the space with the large Clerestory window and didn't have to sacrifice any wall space in the process. 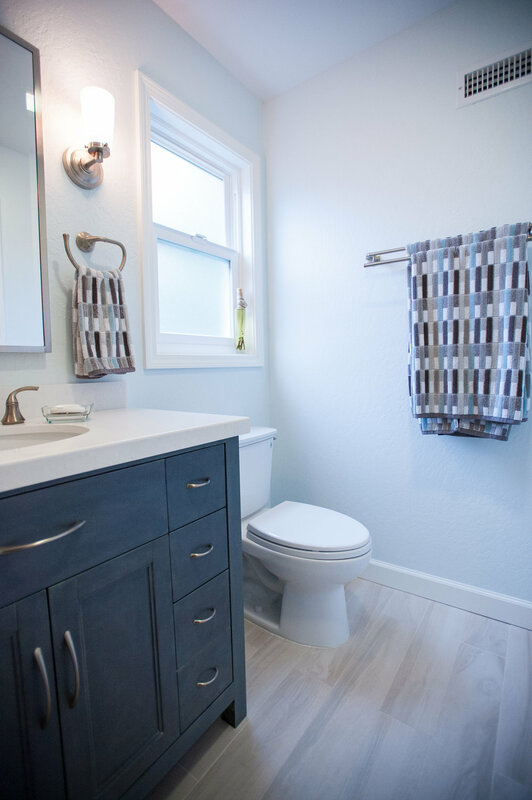 This Walnut Creek bathroom was previously a master closet that has since been converted to a master bathroom. The additional space and new tile increases functionality and is more aesthetically pleasing. We worked closely with the homeowner to decide on the pattern for the tile throughout the space, schluter metal trim was used on all of the wall corners to cap the tile and keep with the modern feel. 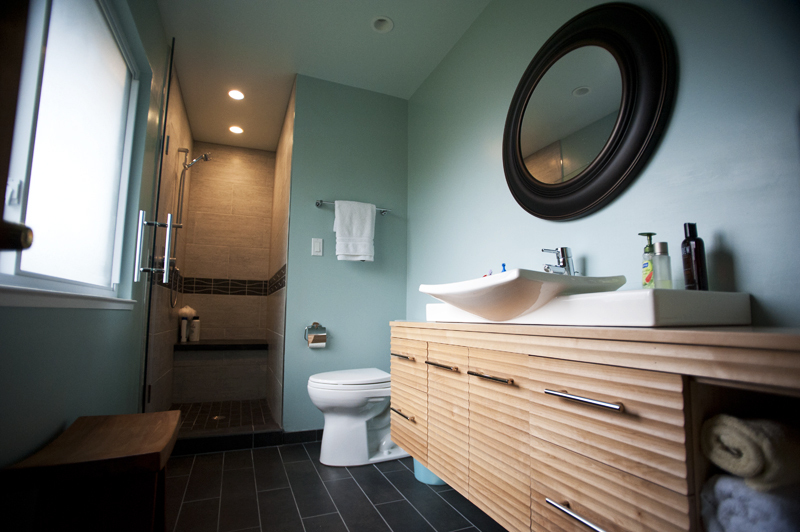 This San Francisco bathroom is a combination of in house design and Jill Cordner Interior Design. 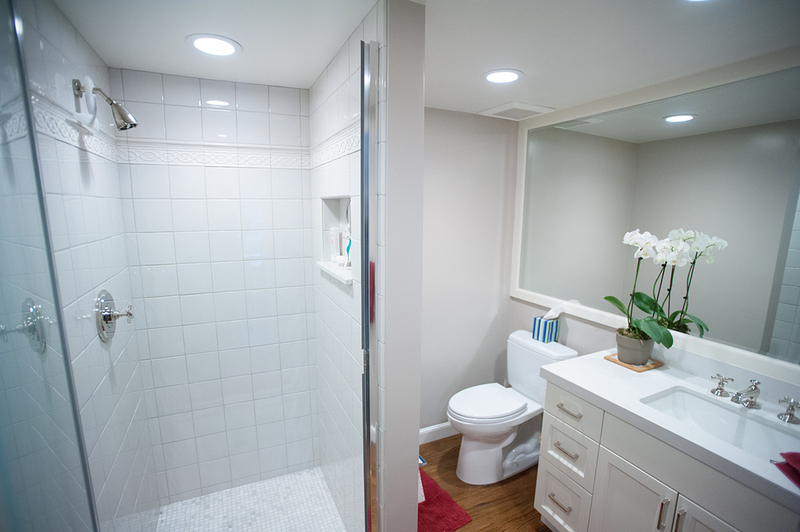 Space planning was a crucial step that was taken to update the layout of this early 1900's bathroom. Updates to the wall framing as well as the floor took place in order to support all of the new features and tile in this beautiful bathroom. 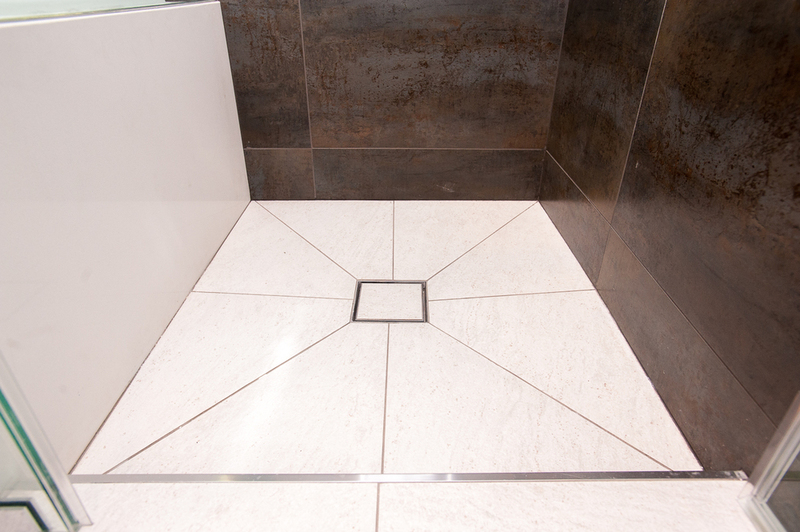 Much thought was put into the tile design as the tile accent band was placed so that it would align the shower niche and the mounted lights near the sink. Mounting the tub filler in the center of the tub and using a glass door that has the capability to swing flush with the opposing wall allows for the client to use the tub as it's intended or as a perfectly comfortable shower. 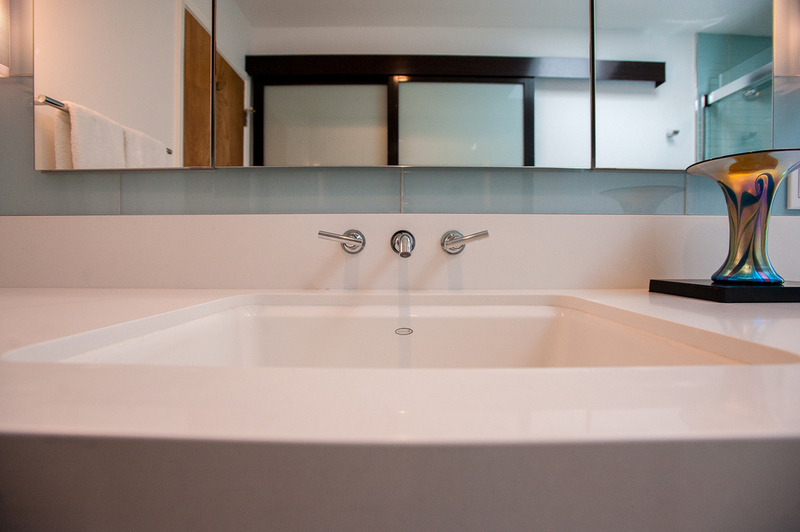 A floating toilet and vanity were installed for easy cleaning and refreshened look. Not a single detail was overlooked in this space. Both of these bathrooms in Martinez were what we like to call "like for like remodels" meaning that the location of all fixtures stayed the same while only the materials used were upgraded. The beautiful custom vanities you see pictured were made by the client himself. Taking over an unused niche in the shower and turning it into a bench made the shower much more user friendly. We're always amazed by how much a room can change by updated the finished materials in the space. With a house full of cabinetry this client wanted to pay extra attention to making it all match. We replaced the vanity in the master bath and updating the adjoining makeup vanity to add a custom holder for the clients hair dryer. 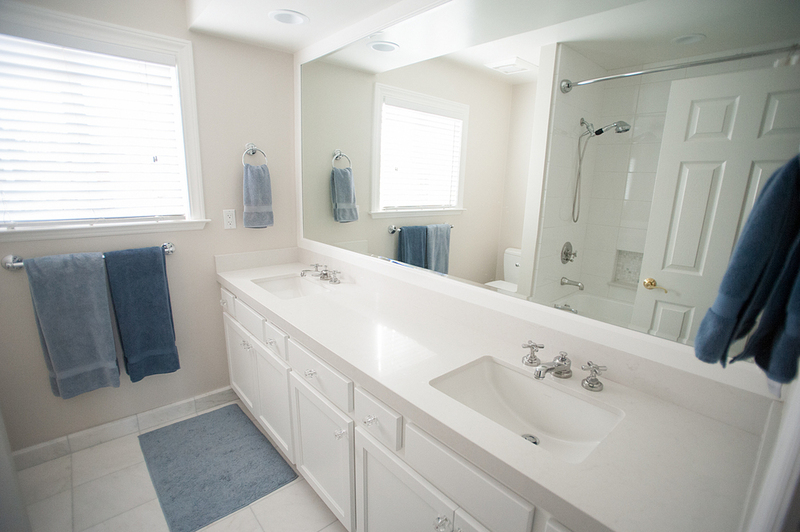 Custom mirrors were also made to match the other bathrooms in the house. New tile in the tub/shower surround in the guest bath updated the space to compliment the multiple other projects that were taking place throughout the home. A beautiful recessed niche was carefully installed for all of the clients products. This San Francisco bathroom was full of original charm. 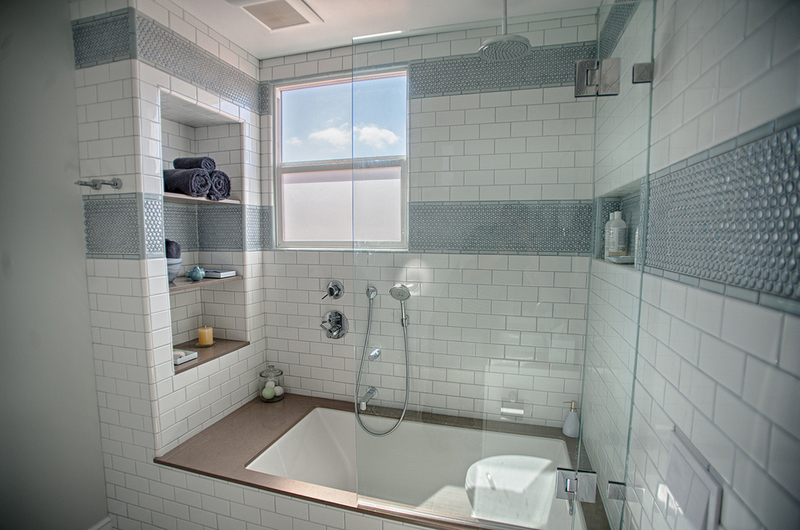 The beautiful open shower was once a tub/shower combo that wasn't functioning as the client wanted. 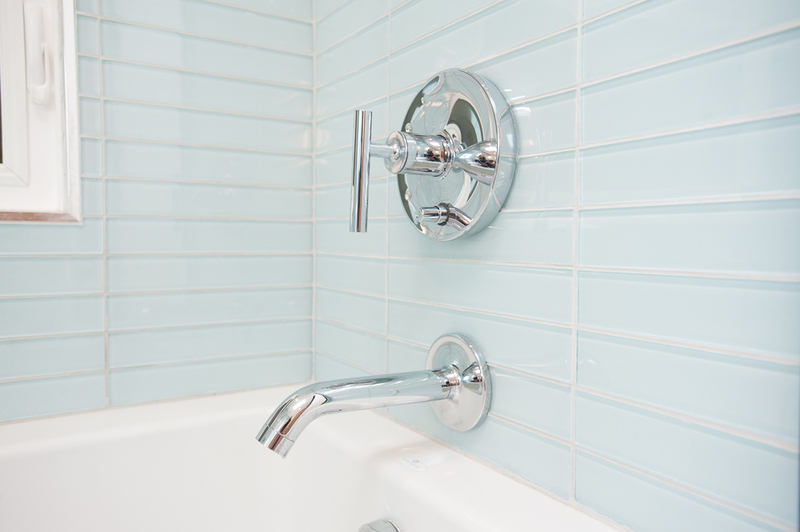 Installing tile on not only the floor but also on the walls makes the entire space waterproof. 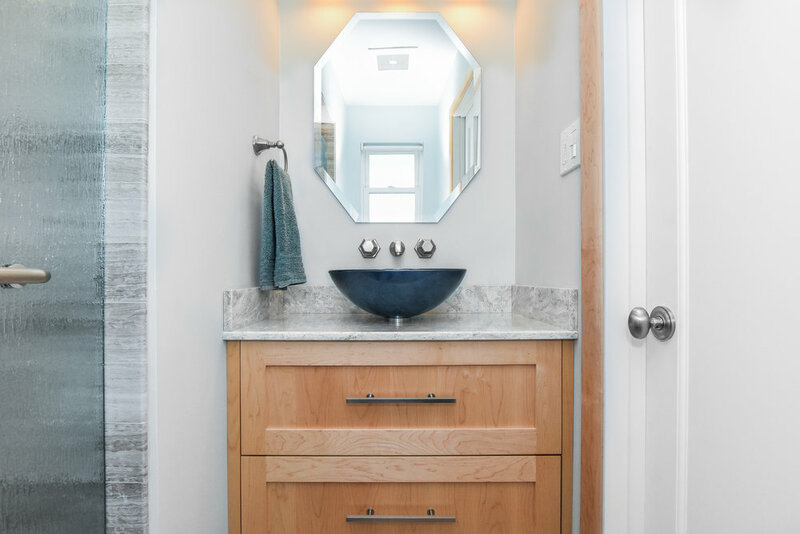 Finishing touches like the careful placement of the lights and hiding the plumbing within the vanity make all the difference in completing the space.